Farad, named for the unit of an electrical charge, is a novella that cuts laser-like through a multilayered society. 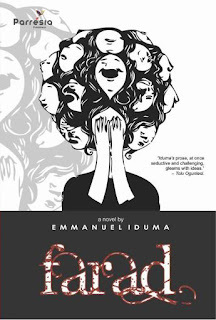 Touching biographies of ordinary citizens, young academics and ageing psychologists, Christian editors and call girls, strange women and music artistes told in stylish, interrupted narratives, are woven into a detailed mosaic of modern Nigeria. Reminiscent of Plutarch's Parallel Lives, Farad eases to a climax when key characters from individual stories become participants in a conflict at a University Chapel - a conflict in which the nature of power is tested. Farad is an assemblage of fresh narratives woven around simple questions and open-ended complexities. It is ultimately, a story of love and essence. It's published by Parresia, and I think it might only be available in Nigeria, but you can read an excerpt here.